Close Encounters of the Costa Rica kind. When staying at The Peace Lodge at the La Paz Waterfall Gardens plenty of close encounters of the Costa Rica kind can be found. One of their best is a hidden secret in the hummingbird garden. Twice a day, at 9:00 a.m. and 4:00 p.m. visitors can feed the hummingbirds. 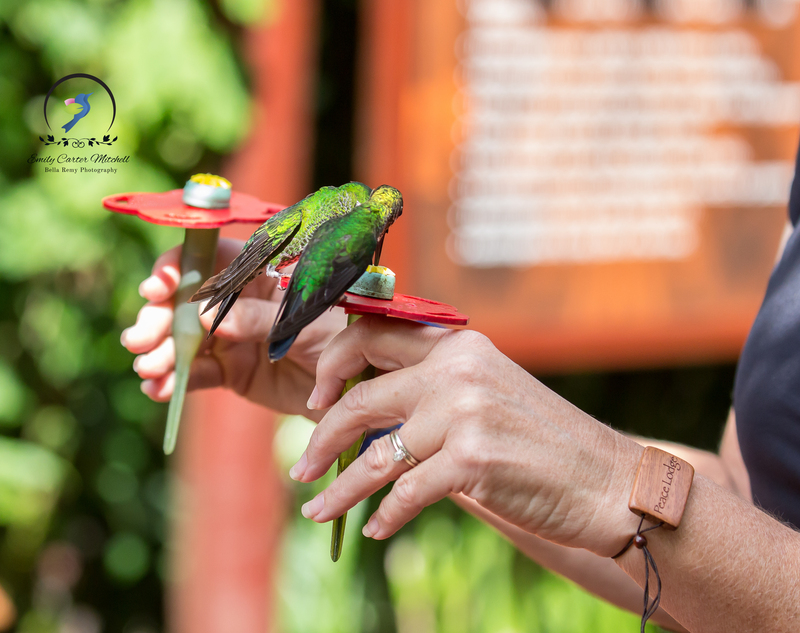 Each guest is handed a small hummingbird feeder to be held in their hands. Wait long enough and they will come and hungrily dine on the sweet nectar. As my friend and I were able to spend two glorious nights at the lodge, we were able to feed the hummingbirds four times. Rain or shine, it doesn’t matter. One of the times, I stood underneath the tree where the regular feeders are hung. Seemed that I had entered into the hummingbird war zone and was buzzed and dive bombed by hummers chasing each other. Such a thrilling experience. They were so fast even my eye couldn’t keep up with them. But with a close fly-by and a whoosh close to my head, I knew that if I had moved, I’d be a moving target. But the fun doesn’t stop there, in the evenings guests can register for a frog walkabout in their frog house. During the day many of these frogs hide in the plants sleeping, then come out at night. With flashlights in hand, we walked into the pitch black frog house and began our search throughout. There were at least five types of frogs in the house, including the hallmark of Costa Rican frogs, the Red-eyed tree frog. But one close encounter at the Peace Lodge was one more than unexpected. We were returning to our room one rainy afternoon, and a surprise guest literally stopped in our tracks. 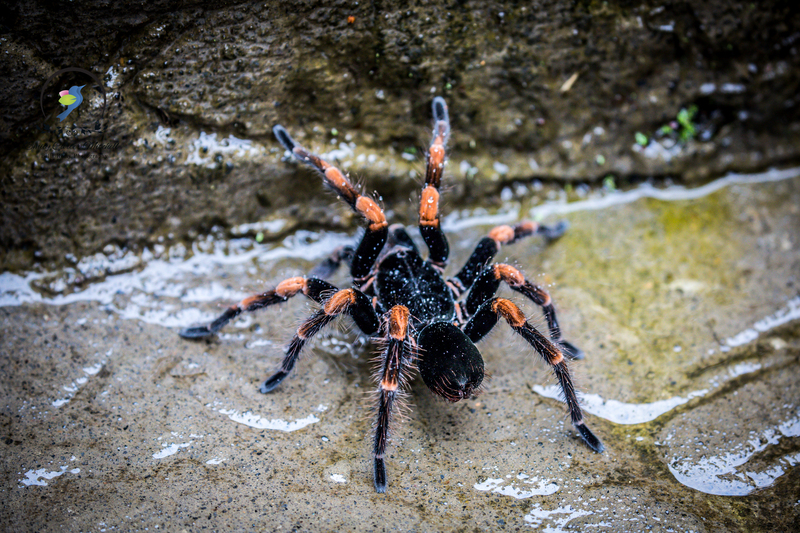 An Orange-kneed Tarantula – yes, you heard it – A TARANTULA !!! It was creeping along on the wet stairs. Of course what does this little photographer do? Grab my iPhone and get close to get a shot. Ok I confess, I was holding my breath while I did it. Please, Please, Please don’t jump on me or bite me. ICK !! After a few captures, I went to the room. Returning a short 10 minutes later to go to the gift shop, the tarantula was long gone. I was much happier when I knew where it was. Truly, Peace Lodge is a nature sanctuary that deserves at least a two night stay. Between the native birds flourishing on the property to the exhibits offered I highly recommend a stay when you visit Costa Rica. What a fantastic place. Gorgeous photos . . . even the tarantula. LOL ! Yes, even the tarantula was pretty cool. Wow, such an amazing place! SO jealous THANK YOU for sharing your travels! Costa Rica really is an amazing place, and hope that one day you’ll have the chance to go. In the meantime, I’m happy to share my adventures with you. It truly is Joanne. Paradise in the cloud forest. Me too and their frogs are so super cool looking aren’t they? it’s a great place with amazing nature! Costa Rica is truly an eden of wildlife. I still am amazed about all that I saw in such a short visit. Oh you made me laugh. Yes.. photos of spiders and snakes are just fine with me too. Thrilled that you know what I’m talking about as to how incredible Costa Rica is.